There are lots of gadgets available on the market which can be used whilst you are away to ensure it looks like someone is in your property. Light switch timers are a fantastic idea, allowing lamps to turn on and off at the pre-set time each day. Doorbells have evolved significantly over the years, with Ring offering doorbells that come complete with video capability and two way microphones, allowing you to speak to the caller through the app, wherever you are in the world. Investing in a home alarm system that sets as soon as you leave your property will give you total reassurance. However you can go the extra mile by installing a home CCTV system that enables you to keep an eye on your property via an app whilst away. 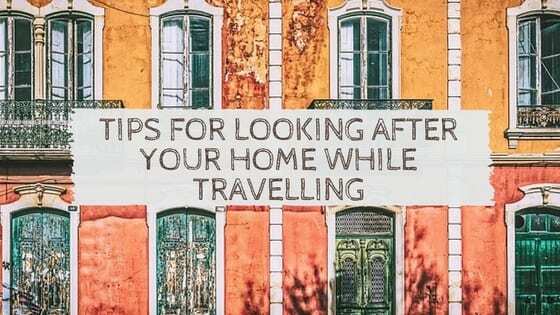 Sim’s Life has highlighted some fantastic ideas on how to secure your home whilst you are away. It’s hard to keep up with the maintenance of your home whilst away, especially when lawns can easily become overgrown and look unkempt. In this case, if you plan on taking several months out for travelling, installing fake grass maybe an option as zero maintenance is required. Give someone you trust a spare key in order for them to keep regular checks on your home and tidy away post from your front door. Ask someone you trust implicitly to move into your home and look after it whilst you are away. This is especially handy if you have pets, as they can remain in your home and be looked after whilst you are away without any added stress of being in kennels. That is awesome and I bet the dogs are happy they get to stay at home too! I also get worried when I am travelling. I have heard about these gadgets that make the lights go on but my main worry is having a device plugged in for all that time and the risk of fire. Call me a worrywart but that would cause me more stress than being burgled. I am a stress head when it comes to having things plugged in but light timer switches are awesome! I know the feeling well, being able to check CCTV on an app always helps for reassurance! Thank you chick – you know it, fake grass is definitely the way forward. Just always looks neater too! Very helpful, the last thing you want to come back to is a burgled house. And from someone who has been burgled before, I can assure you it’s terrifying. These are great ideas. Some great tips here . I’m very lucky to have family nearby who call into the house daily . Thank you! 🙂 Always handy to have friends and family locally who can keep a check for you! Great tips! We’re lucky enough to have some great neighbours around to give that extra peace of mind. I am looking into CCTV, though, so thanks for the reminder! You are very lucky – I too have some fantastic neighbours who check on my house, but also have some donuts 🙁 CCTV gives you peace of mind and most systems now allow you to check via an app on your phone, very handy! These are great tips. My mum regularly pops round to our house when we’re away “just in case”! It’s a really good idea to have someone simply pop in and just check everything is ok! Great tips! It’s so important to leave your home secure, you can never be too safe these days! We cant CCTV! A home sitter is so important! I think it’s always quite obvious when people go away and just leave their curtains shut the whole time.